I like organization. Anyone who knows me will attest to this fact. I like the idea of organizing everything from my wardrobes to my kitchen cabinets in a particular manner. 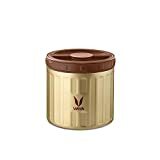 Which is why I was so thrilled to get this pack of 4 Vaya Preserve stainless steel food storage containers last week, just in time for Diwali. Organised cabinets mean more time for me to focus on things that I love to do, which, let’s face it, mean more organizing 😉 But , seriously, these are really lovely! So excited was I that I immediately did a short, unboxing video on my Instagram feed. As expected, many readers were fascinated by the features that they could see in the video. 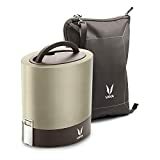 Based on my own use and also to answer some of the key questions raised by those who saw the video, here is my unbiased Vaya Preserve Review. They’re made of stainless steel. I have been so intent on moving over to glass or steel and do away with the plastic containers in my kitchen. Perhaps this is the push that I finally need. I mean, just seeing them next to my plastic containers is tempting me already! They are spill-proof and leak-proof. This is one thing I truly love about Vaya’s products and that has proved true of both the Preserve and their Tyffyn variants. I can use the Preserve to stock dry items such as rice, pulses and flour. In addition, they can be used to store gravies and cold items too! The finish is so sleek on the Preserve and the lids are quite sturdy. One thing I noticed is that the lid is designed with a good, heavy-duty grip. This may be the MOST favourite feature of all.They are stackable! That means, you can be optimizing space even in small kitchens. Watch the video below to know what I mean. Such a simple but innovative technology. Here are some of the specifications that can be found listed in greater detail on the FAQ section of their website. 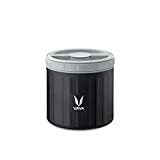 Vaya Preserve is a vacuum insulated food storage and stacking container set. 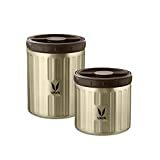 The plastic lid is made of bio-polyester and is BPA free while the metallic body is made of food grade stainless steel. It comes in two sizes- 300 ml and 500 ml. It can be used to store both dry and cooked food items, hot as well as cold. Q.1: Is the Vaya Preserve Dishwasher safe? Answer: The Stainless steel container is dishwasher safe. The lid is not. Q.2: Is the Vaya Preserve Microwave safe? Q.3: How do I ensure the food stays hot/cold for 4 to 6 hours? Answer: If storing hot food, remember to prime the container by filling it with hot water and letting it sit for a few minutes. Empty the water and fill it with the hot food item of your choice. Do the same with cold water for cold items. *Personally, I found that it keeps food warm and not piping hot after 6 hours. I shall have to test again at 4 hours to re-confirm this. Q.4: How much does it cost? Answer: You will have to check the site for the updated prices but here are the launch prices as of November, 2018. Price. Yes, it can seem a bit steep to pay 1500 for 2 steel jars. But I checked on Amazon and realised that the closest equivalent to this costs close to that anyway. So looks like it’s not a bad deal at all for the Vaya Preserve given its other features of insulation and heat/cold retention. *The product is yet to be launched globally. When it is, global customers can visit Vaya’s Global Resource page and place your order. 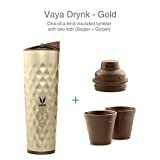 Disclosure: I was sent a set of 4 Vaya Preserve containers for personal use and review. This is a sponsored post but the views expressed are my own. I am planning to do away with plastic containers in my kitchen and Vaya Preserve seems like the best option. I like their sleek and sturdy look. Will check them out. Thanks for a comprehensive review, Shailaja!